NextDoes Laclede’s Landing or the Arch Need Washington Avenue? Biking is relatively easy across most of the City of St. Louis. The street grid makes it easy to get around and easy to find a street with light vehicular traffic… most of the time. Other times, biking within the city can a frustrating affair when one comes upon one of the 262 points where the street grid has been severed. Many of the 262 street closures within the City of St. Louis were done with the benign purpose of reducing vehicular traffic on residential streets. Many of them, also, had a not so hidden subtext to shield wealthy neighborhoods from nearby crime and urban decay. Street closures within the city are generally set in three common variations. The most elaborate street closures include small gardens and decorative fencing within the former street space. Slightly simpler, some closures simply convert the streets into two large bulbs separated by five feet of grass and concrete. The most basic street closures are performed by simply placing a series of large concrete planters, often made out of ugly concrete sewer pipes, within the street right-of-way. A crude asphalt ramp allows bicyclists to reach the sidewalk on Laclede Ave just east of Taylor Ave.
Of the three common variations of street closures, only the ones with concrete planters generally allow cyclists to go through without using the sidewalk. The other types of closures almost always lack any sort of cut-through passageway for bikers or even a ramp to access the sidewalk. 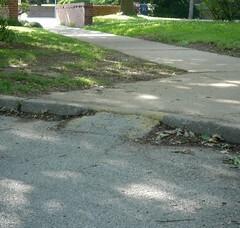 If ramps are found, they are often crudely built, such as the one pictured on the left. Anyways, to avoid rambling any further, most streets within the City of St. Louis have been closed for one of two reasons: to reduce or hinder vehicular traffic or to ward off crime. These barriers, however, were not erected to keep bicyclists off of neighborhood streets, though that is their effect. Bicyclists will not harm the quality of life these street barriers were erected to protect. Also, bicyclists should not have to zig-zag across city streets to find a continuous route. All new street closures must include accommodations for pedestrians and bicyclists to get through, where possible and reasonable. For an example, please see this short film from Streetfilms about Portland’s use of “diagonal diverters” that keep streets free of vehicular through traffic but allow bikes to get through. Today and tomorrow, Great Rivers Greenway is hosting open houses for the St. Louis regional bike plan. Please attend or sumbit comments if you wish to help shape the future of cycling in the St. Louis area. St. Louis has multiple diagonal diverters in the Shaw neighborhood. As a cyclist, I find these closures just as annoying to a ride or commute as conventional closures. Anonymous and Will, those intersections aren't quite what I had in mind. Crossing Spring going east on Russell requires jumping onto the sidewalk on the right or going left around the barrier and then briefly going the wrong way down Spring.Take a look at the film I linked to above and you'll see an intersection something vastly different and better than the one at Russell and Spring. All I'm really asking for is small passageways that allow bicyclists to travel through street closures without having to jump a curb or ride in the sidewalk. Yep, there's one at Russell & Spring: http://bit.ly/bbidTGOf course, it'd be great if we just stopped closing streets altogether. Will any of the planning meetings actually be held in the city? Or perhaps they already have been and I missed them. But why close local streets even diagonally? A grid is the best deterrent to cut-thru traffic. And shorter blocks discourages speeding. Re-open all streets! Does Laclede’s Landing or the Arch Need Washington Avenue?